Waterparks have had a good journey on the music scene since emerging on the scene back in 2015 and quickly being signed by Equal Vison Records and being managed by Benji and Joel Madden of Good Charlotte under their MDDN management company, the EP ‘Cluster’ was quickly released in January 2016, that was then followed up by their debut album ‘Double Dare’ on the 4th November 2016 and now Waterparks are gearing up to release their second studio album ‘Entertainment’ on the 26th January an album which their fans are eagerly waiting to hear after already being teased by the solid singles ‘Blonde’ and ‘Lucky People’. 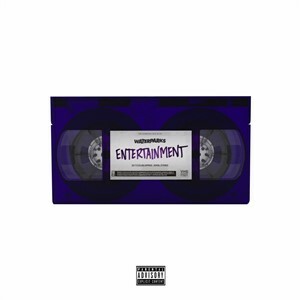 ‘Entertainment’ saw Waterparks hit MDDN studios with Benji Madden and Courtney Ballard, the same team that worked on ‘Double Dare’ and judging by how big and infectious ‘Entertainment’ is it totally made sense for Waterparks to keep to this award winning formula. The album opens with ’11.11’ a song which oozes with electronic beats and fast paced pop-punk riffs and extremely infectious lyrics which really grab your attention when the insanely fast paced chorus kicks in and the song fully comes to life in a huge sing-a-long way. ‘Blonde’ is the lead single to be taken from the album and it is easy to see why as the song is insanely catchy it is a proper radio friendly number and the vocals from Awsten Knight are outstanding as he goes on a fast and frantic vocal assault which is so infectious and such a joy to listen to, it’s the kind of song you will wait all night to hear at the bands live show and have the time of your life for the 3minutes 30seconds it runs for and then be instantly gutted once the song comes to an close as it really is the kind of song you just want to listen to again and again and luckily you can in the pleasure of your own home. ‘Peach (Lobotomy)’ opens up with a bouncy riffs and some whistling and seconds later the electronic synths come in and that’s pretty much how the song progresses for the next 3minutes or so with Awsten Knight singing “Let me go let me go down” over and over again. 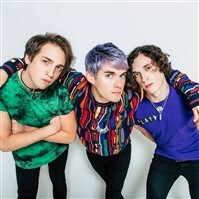 ‘We Need To Talk’ is a fun little track and one that shows despite having the same team working on the album Waterparks are not going to make a carbon copy of ‘Double Dare’ and are instead going to go all out and experiment with their music and that is exactly what they do here as ‘We Need To Talk’ is very slow paced with the same synths constantly running through the song, vocally Awsten Knight perfectly tells a story in a more spoken word way thanks to the laid back feel of the synths and instrumental work. The synths on ‘Not Warriors’ sound like they have come straight from the 80’s and leads the song on a catchy as hell ride especially when the vocals kick in as they are huge and melodic. ‘Rare’ is a straight up pop-punk track full of tasty riffs and catchy vocals. ‘TANTRUM’ see’s Waterparks knock the riffs to level 11 as they go out and rock harder than they ever have before which huge riffs, soaring vocals and massive robotic electronics. ‘Crybaby’ is similar to ‘We Need To Talk’ in the way that it is totally different from anything Waterparks have done before, in fact you would be forgiven for thinking it was a totally different band playing this song, yet they seem to make it work. ‘Lucky People’ happens to be the second teaser single from the album being released only a couple of weeks ago and it’s a beautiful acoustic song, and the stripped back feel of the song really gives you the chance to listen to and enjoy the infectious vocals from Awsten Knight as he tells a sad story about an ex-girlfriend. The album comes to a close in a big way with ‘Sleep Alone’, a song which see’s Waterparks give it their all from huge synths, driving guitars riffs, constant drum beats and infectious vocals which has Awsten Knight shouting out “You can call me on my phone” during the catchy chorus. Since releasing their EP ‘Cluster’ back in 2016 Waterparks have been on one hell of a ride, they have already supported heavy weight pop-punk acts like All Time Low, Good Charlotte, Sleeping With Sirens, State Champs and more across the world, their debut UK headline tour sold out in advance, their forthcoming UK headline tour is set for March and I am sure that will sell out before the tour starts once people get hold of ‘Entertainment’ as it really is an outstanding album and one that proves that Waterparks are going to be on the music scene for a long long time as they have the same buzz as bands like Panic At The Disco!, Fall Out Boy etc when the first hit the music scene and look where they are now.